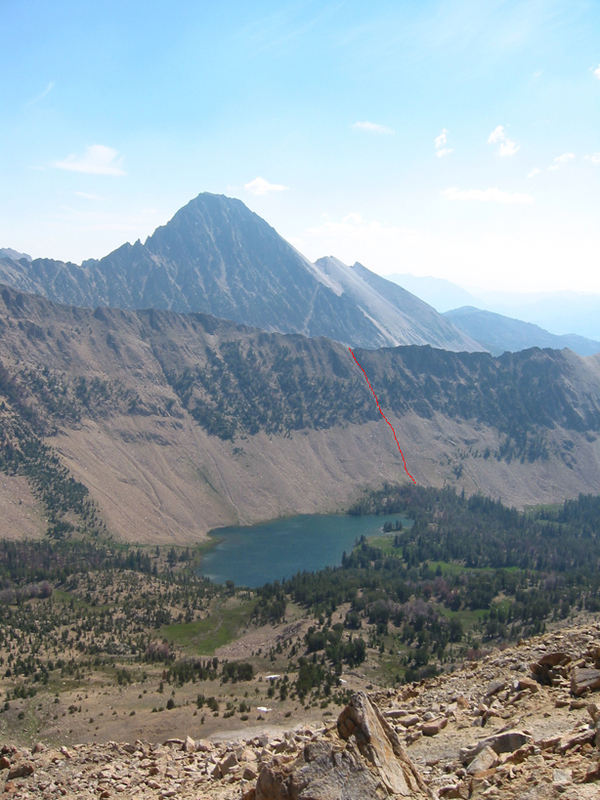 Castle Peak should be on every climber's list, with possibly the best view in Idaho. We left Boise at 6:30 am got to the trailhead at a little before 10. There were a ton of cars in the parking lot. With such a beautiful day, cool temps, and loads of anticipation, the walk into Fourth of July lake didn't seem to take much time- and we were there. We only saw one person at the lake. From Fourth of July lake, it's a short walk over Washington Pass and then we dropped down to Washington Lake. There wasn't anyone here. No one. It seemed weird after all the cars in the parking lot. 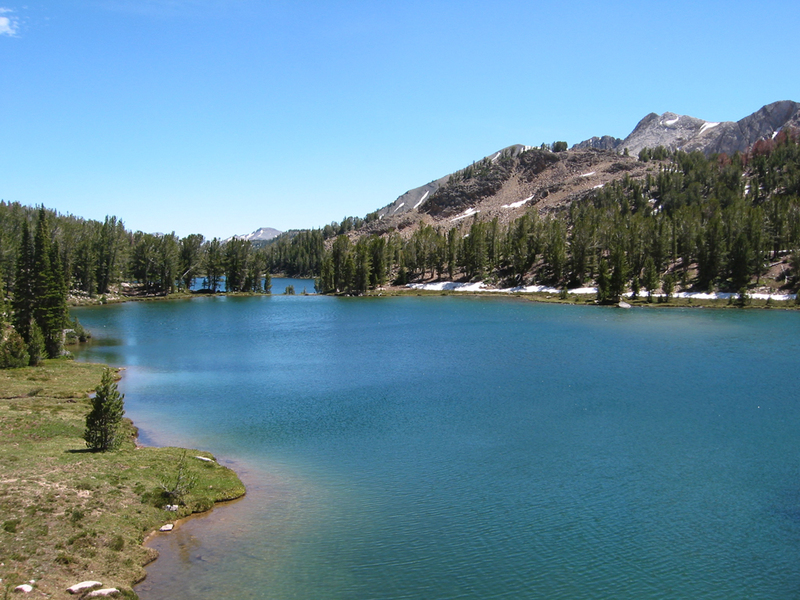 At the far end of the lake, we took the shortcut into Chamberlain Basin. It's a steep, narrow gully up and over the ridge. About 700' on this side, and around 300' down the gully on the other side. 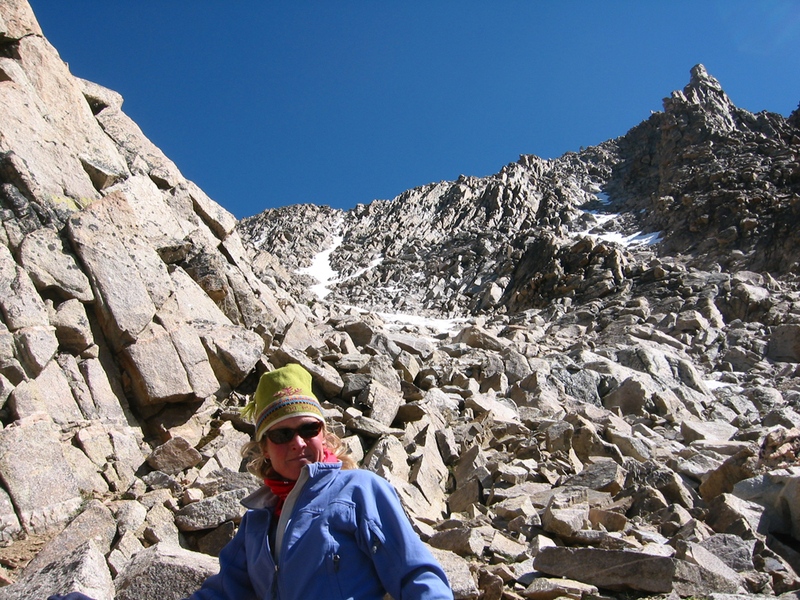 Julie was not happy in the steep, loose rock and scree. She is near the lower left of the picture. We were not exactly traveling light. Big Dan had forwarded a picture taken the previous weekend showing the south gully of Castle had a lot of snow, so we were carrying ice axes, crampons, and a rope. These chutes are hard work, but they cut off about 6 miles of hiking (assuming you wanted to end up in one of the upper lakes). 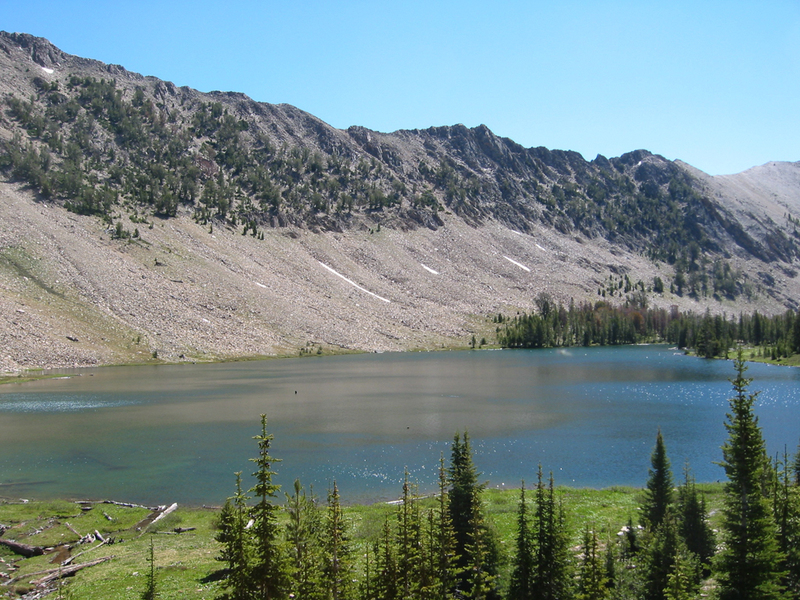 This is a picture of Washington Lake and the chute taken from the top of Fourth of July Peak on another trip. 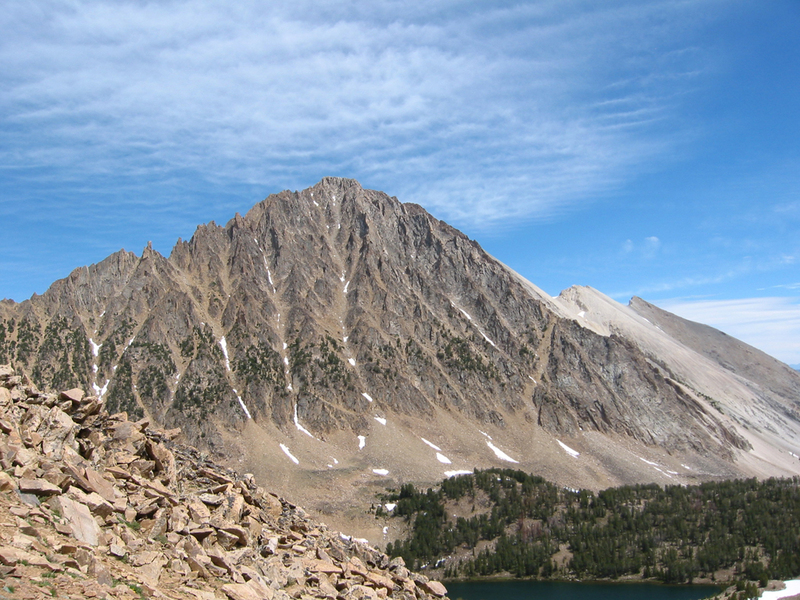 After some struggle, we got to the top of the pass to get this great view of Castle Peak, and also Lake 9477 at which we camped. 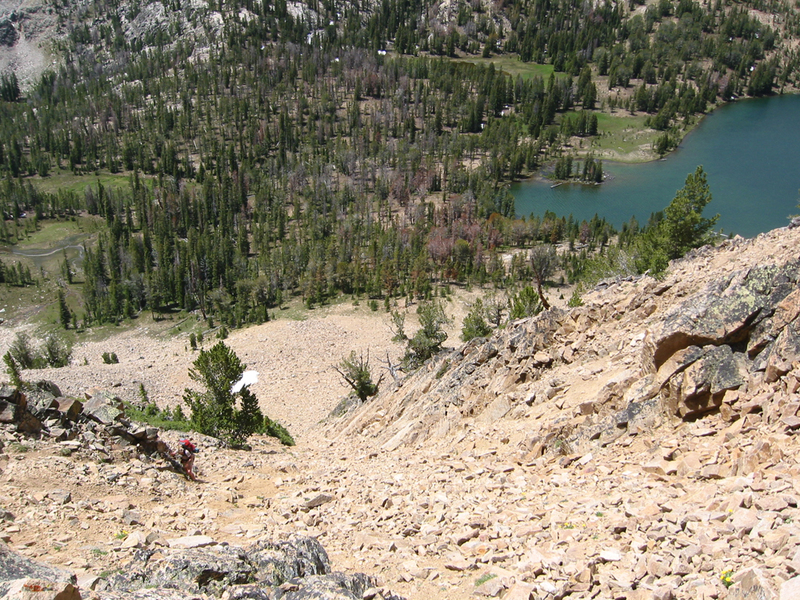 But first, we had to descend the chute on the other side of the pass. Although shorter than the one we climbed, the second chute was even steeper. We got to our campsite in about 3 1/2 hours from the car. The chutes were tough, but the reward for our tribulations was great. This picture actually shows two lakes. Pretty, eh? 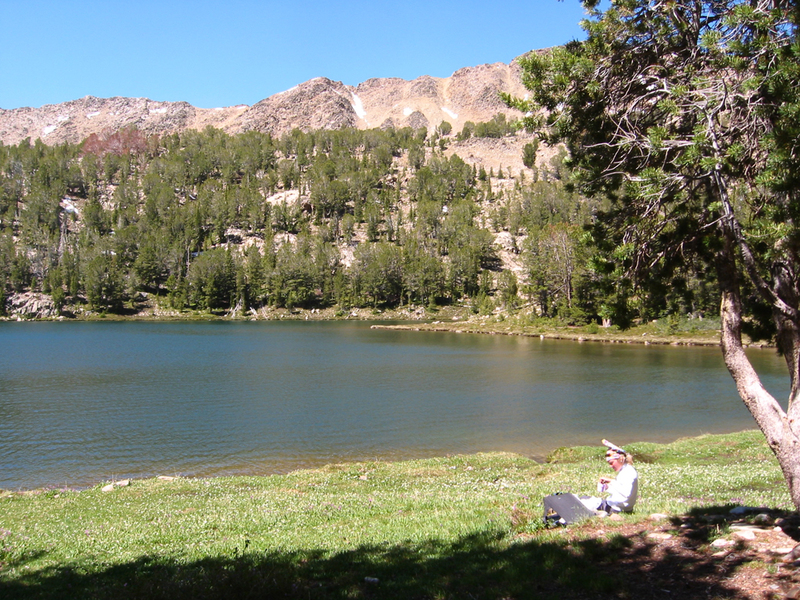 We set up our deluxe camp at the lower lake seen here, then we hiked around, visiting several lakes and exploring the basin. 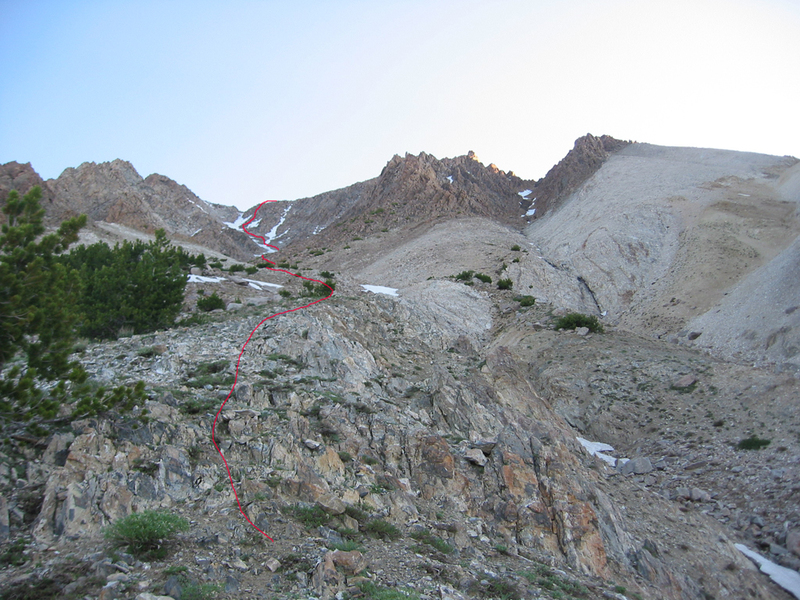 If you go into Chamberlain Basin, you owe it to yourself to take the grand tour. 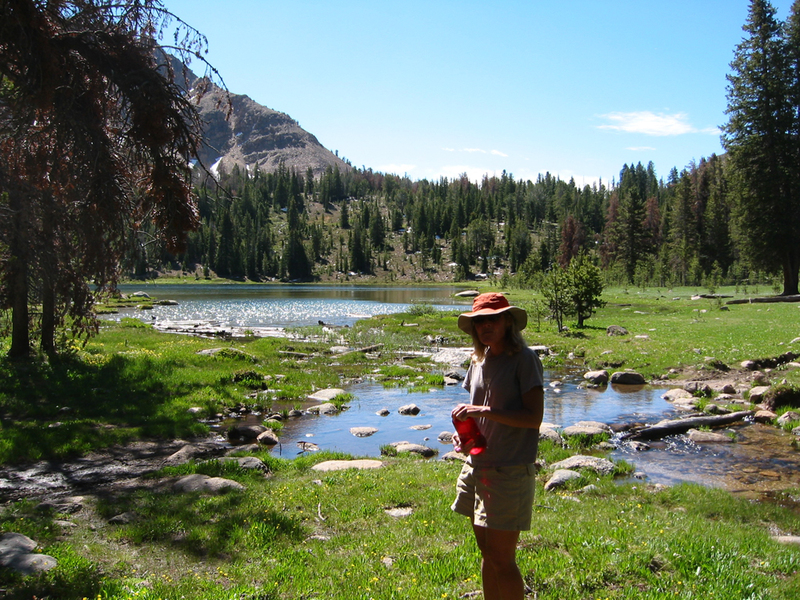 As we wandered around from lake to lake, we saw tons of great campsites but, we did not see a soul. There was a constant breeze, so the bugs were minimal. After dinner, we watched the sun go down and hit the sack. The next morning was summit day. We got up at 5am and it seemed rather warm. To lighten the load, we left the crampons in camp. But we still hadn't seen into the gully, so we took the axes and rope. We were walking at 5:45. After a 30 minute hike down a good trail toward the "main" lake, we started the actual climb at 6:15. 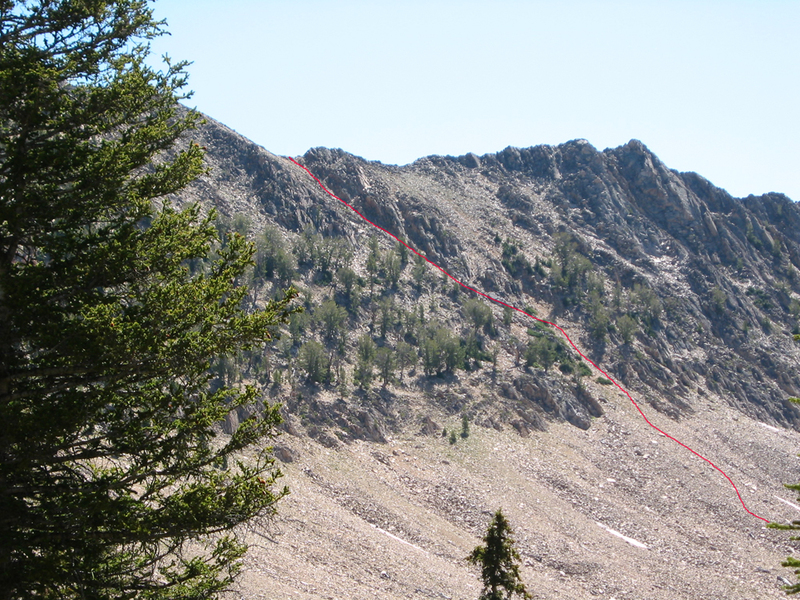 This picture showing our route was taken at about 7, from around 9700'. Although there was snow, it wasn't continuous. But it was solidly frozen. Due to the low light during the climb, we didn't take many photos on the way up. We worked our way up the gully, moving from side to side to avoid snow or follow easier terrain. 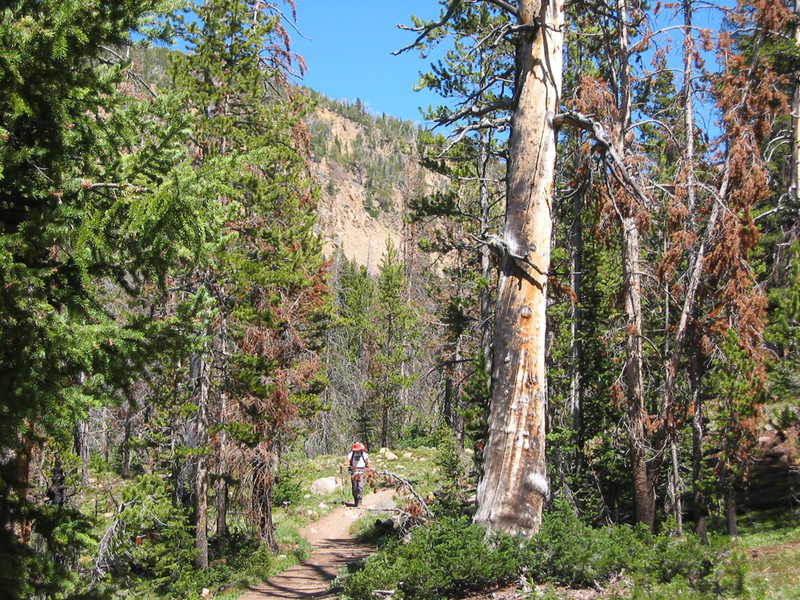 In many sections, there is an apparent climber's trail. 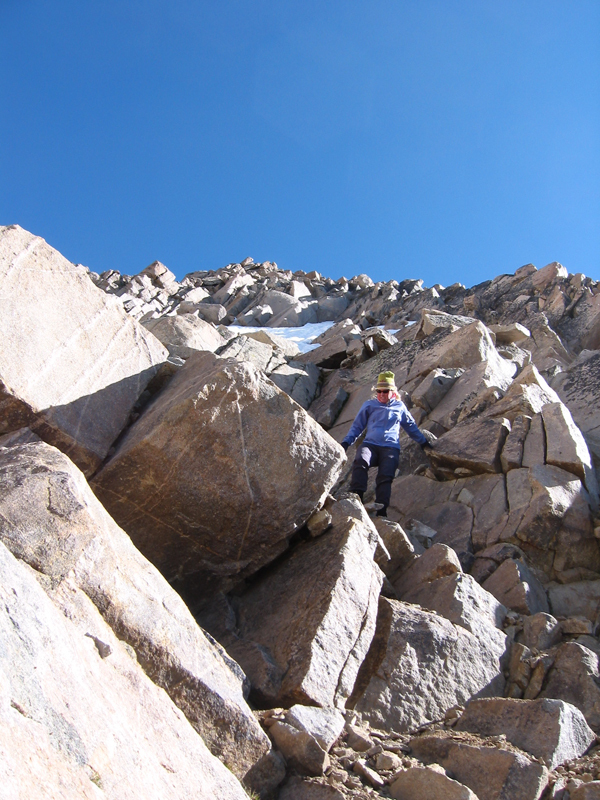 Up high, we had to leave the center of the gully to avoid snow, instead climbing the rocks on the sides. The last 300' or so is all rock climbing anyway- we just had to move to the right side a bit more than is usual (usual based on the cairns we saw, anyway). We finally got into the sun right below the summit. Here we are on top at about 9:15. NOAA had predicted partly cloudy. They were wrong to our benefit. Not a cloud in sight. Light winds. About as perfect a day as you could ask for. Then it was time to go down. 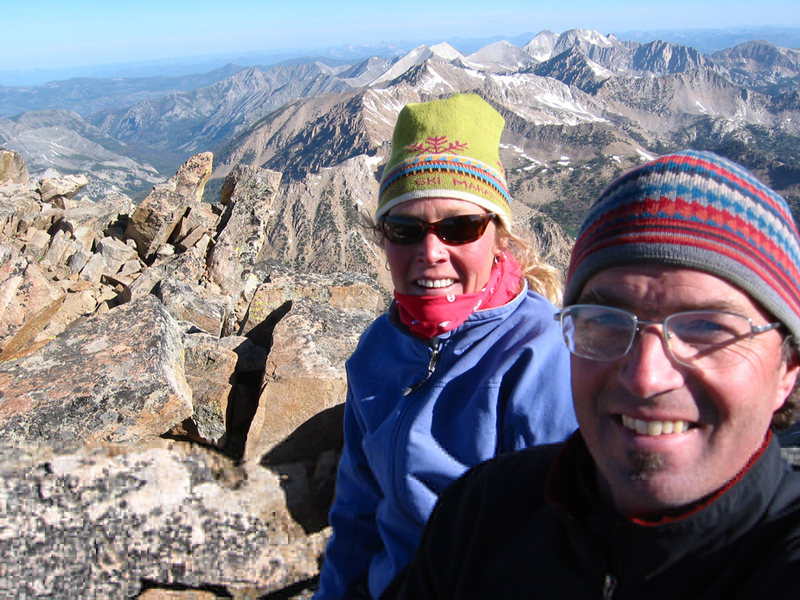 During our ascent, I tried hard to identify landmarks that would guide us back down. No go. 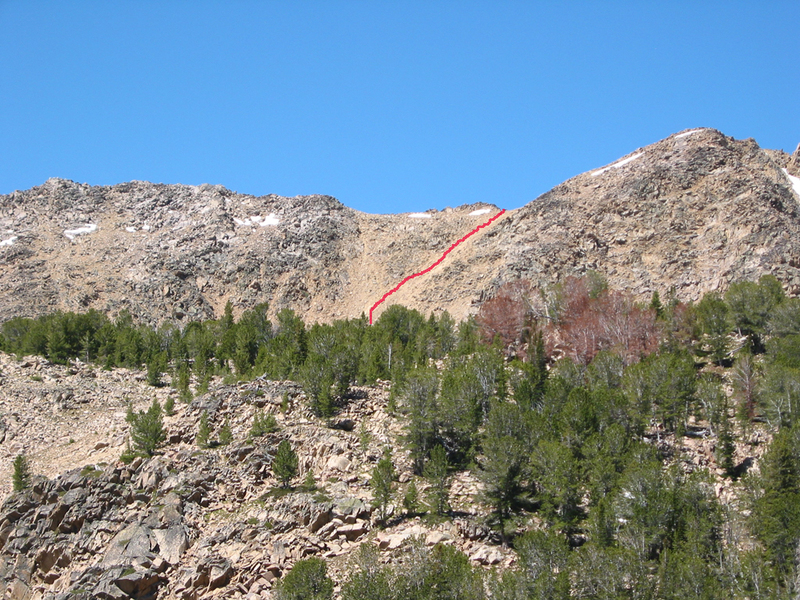 This is steep terrain, and it is very possible to get cliffed or worse. I was more than a little nervous as we began climbing down. But when we started downclimbing, I was able to identify about 90% of the moves we had made. Whew. Julie liked the actual climbing part. She wasn't too happy about the scree slogging, especially going downhill. And there is a little bit of that to do in the gully. But with such a perfect day, who could not smile? We got back to our campsite a little after noon. We packed up, and made some more coffee. Here Julie kicks back in the wildflowers and tans her feet. There was just enough breeze to completely eliminate the mosquitoes.. and make her bandanna stand up. Unfortunately, her relaxation was short lived, because from where she sat, our shortcut route back over the ridge was staring her in the face. It took some effort and time, but we got over the ridge without incident. It was with gratitude that we got back on a real trail. About 5 minutes from the car, we finally saw someone hiking up the trail. We arrived back to the car at about 3:15. We grabbed a burger at Redfish and listened to some emo music, then booked for home, talking about our next anniversary.